This Spiced Apple Cake is dotted with chewy bits of dried fruit and nuts and drizzled with salty bourbon caramel sauce. It’s perfect for fall and would be lovely on your Thanksgiving table! Visiting my very first blog posts from over 6 years ago is a little like going back to your parent’s house and cleaning out your childhood closet. It’s 3 parts nostalgic, 2 parts hilarious, and 1 part horrifying. You stumble on the costume your mom made for your role in The Music Man (nostalgic), a video of you and your middle school friends doing a talk-show inspired makeover show in the basement (hilarious), and your 8th grade school picture which appears to be sponsored by fuzzy turtlenecks, Sun-In, and curly bangs (horrifying). Reading those early posts certainly gives me a shot of nostalgia. I remember that fresh faced newlywed fondly. She was young and curious and blessed with an amount of free time I can only dream of these days. One night she opened up her computer, clicked “Create Post” and shared a camera-phone picture of her dog and her dinner with the rest of the world. The picture of my dog is hilarious. The one of my dinner? More on the horrifying side. There’s a whole lot of horrifying to go around in those early posts, but there are also some gems that have sadly gotten buried in my proverbial blog closet. 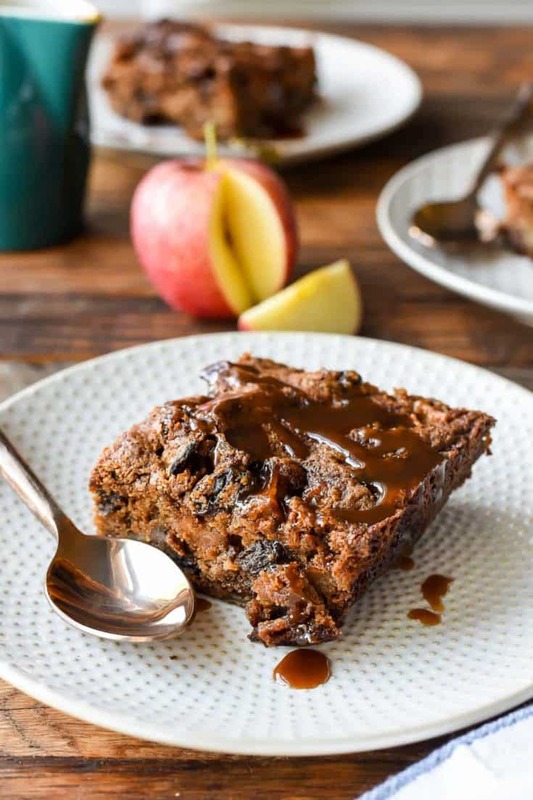 One of those recipes is this Chewy Spiced Apple Cake. I happened upon this recipe recently when I was cleaning out some old posts and knew it had to be brought back to life. Here’s my original picture. Let’s take a moment to dissect. At this point, I was actually taking photos by a window, which, if you can believe, is a huge leap forward. Unfortunately, my white bounce board is clearly visible on the left hand side, the window is clearly visible on the right, and the cake platter in the back in crooked in a way that makes me want to grind my teeth down to nubs. Not to mention the very rustic knife handle propped in the back and the artfully paired patterns of the plate and placemat. But hey, at least I achieved that elusive slightly blurred background I’d started learning about…so…yay?? I knew not many people were going to traipse back into the dark archives of the site to find this recipe, and frankly, I’d be a bit mortified if they did. 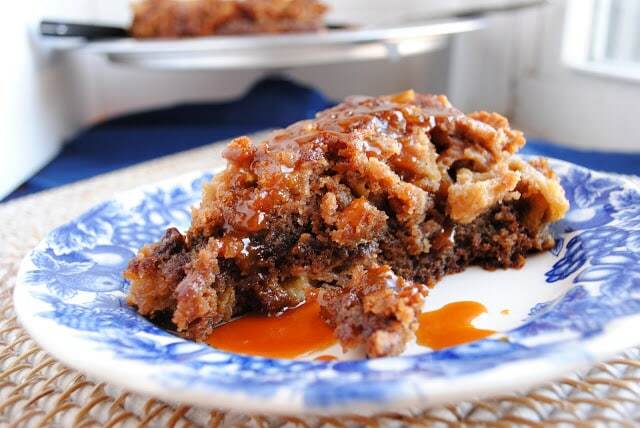 Even after all this time, this recipe still lives on as one of my favorite fall desserts. It just needed a little dusting off. This time of year, I’m not about fluffy, airy cake. Save that stuff for July. In the fall, I want chewy, spicy, dark desserts, and that’s exactly what this cake delivers. There’s a lot going on here–bourbon soaked raisins and dried apple slices, chunks of fresh chopped apple, and crunchy bits of toasted pecans. Honestly, the fruit to batter ratio here is so high, I always worry I got something wrong as I’m pouring it into the pan. But alas, this recipe never disappoints. 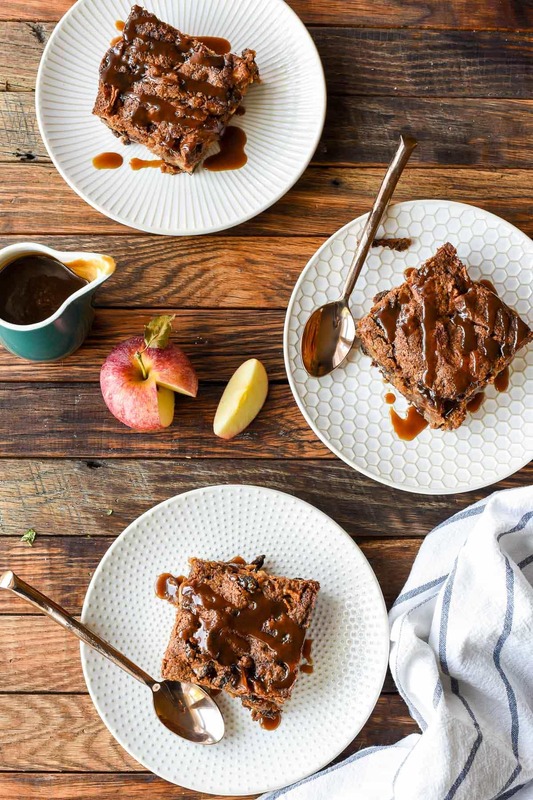 That fruit filled batter becomes a tender brown sugar cake dotted with delightful bits of chewy apple and pecans. If you don’t like “stuff” in your cake, this recipe probably isn’t for you. But if you like a cake to surprise you with texture and flavor in every bite, you’re going to love this. If I haven’t convinced you to try this yet, I hope the addition of this special caramel sauce will do the trick. It’s simple–just butter, brown sugar, and cream–but a hint of bourbon and salt cuts the sweetness and helps it to stand up against the strong flavors of the cake. And it’s not just good for cake. You could drizzle this stuff over ice cream, yogurt, pancakes, or just lick it straight off the spoon. This is the kind of cake you’ll want to eat warm with a big scoop of vanilla ice cream. Or, if you’re like me, you might just eat it straight from the pan, munching on all the little niblins that have fallen from the cake. There’s enough fruit in this that I feel it *almost* qualifies as breakfast, but don’t say you heard that from me. This cake could also make a lovely addition to your Thanksgiving tables. A little something mysterious is always a welcome sight amidst the sea of pies. Whether you enjoy this for breakfast, dessert, or a special occasion, I hope you love it as much as we do! 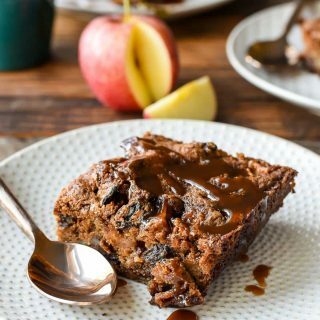 This chewy spiced apple cake is packed with dried fruits and nuts and warm, fall spices for a decadent fall dessert. 1. In a small bowl, combine bourbon and raisins. Let soak for 30 minutes, add apple slices, then soak for another 15 minutes. Set aside.2. Meanwhile, preheat the oven to 325 degrees. Grease a 9 x 13 in baking pan or 2 9 in round cake pans then line with parchment paper. Grease the parchment lightly with butter.3. In a small bowl, whisk together flour, baking soda, salt, cinnamon, nutmeg, and cloves.4. In the bowl of an electric mixer, beat both sugars on medium speed until totally combined. Add the eggs and beat on medium speed until the mixture becomes thick and light in color, about 3 minutes.5. Add the cooled melted butter and mix on low until just combined. Add the dry ingredients in two additions, stirring with a spatula or wooden spoon until the flour is just moistened.6. Add the dried fruit and bourbon mixture (undrained), apple chunks, and pecans. Stir by hand until evenly distributed. Do not over stir.7. Pour the batter into the prepared pan and place on center rack in oven. If using the 9 in cake pans, bake for 50-60 minutes. If using the 9 x 13 in pan, bake for 65-75 minutes. The cake should spring back when touched and a toothpick inserted in the center should just have a few crumbs clinging to it.8. For the caramel sauce, combine the butter, sugar, and cream in a sauce pan over medium heat. Stir until sugar is dissolved and butter is completely melted. Raise heat to medium and bring to a gentle boil, stirring continually (I'm serious about this! If you leave this for more than 10 seconds you risk a giant caramely overflow!). Boil for an additional 3-5 minutes, or until sauce is thickened and golden brown. Remove from heat and stir in bourbon and salt to taste. Serve immediately or store in an airtight container in the fridge. The sauce can be reheated in the microwave in a microwave safe container or on the stove top. 9. 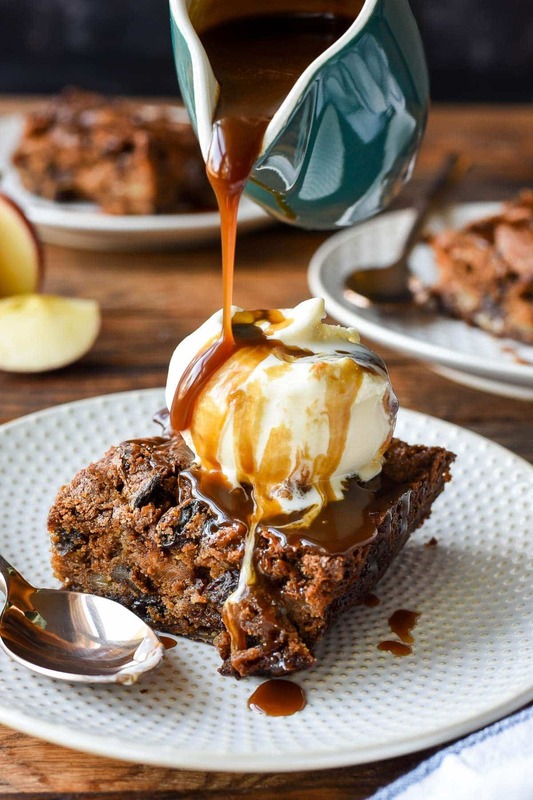 Serve the cake warm with the caramel sauce and a scoop of ice cream, if desired. 2. 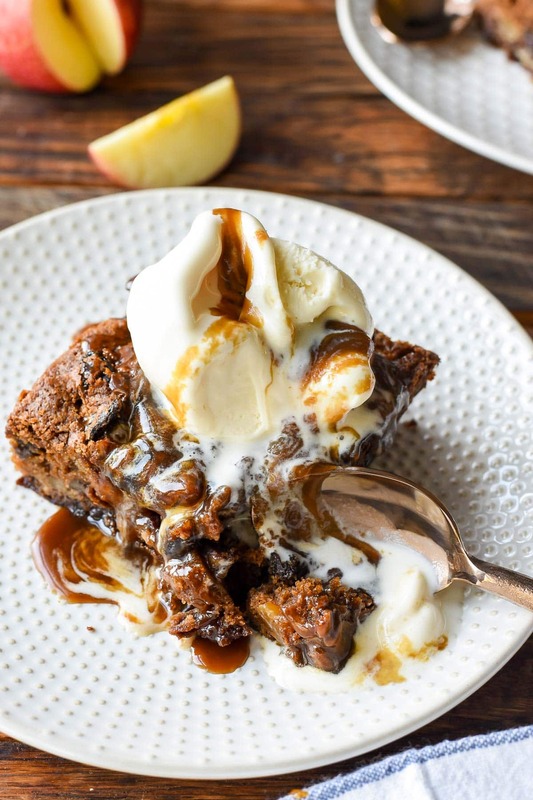 If you would like to make this recipe without alcohol, substitute apple cider for the bourbon in the cake and vanilla extract for the bourbon in the sauce.